Macy Stoddard, a nurse from Manhattan, comes to Hallstead Island in the North Country of New York to escape a haunting pain. It is here that Macy discovers secrets that were not meant to be shared – secrets that reach back into Macy’s past and that will change her future and the futures of the people on Hallstead Island. There are those, however, who will stop at nothing to keep the secrets that are hidden there. Secrets of Hallstead House is available at Amazon. 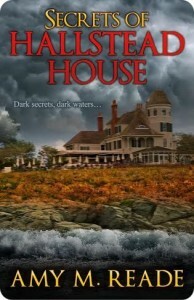 SECRETS OF HALLSTEAD HOUSE by Amy M. Reade is Romantic Suspense. This is the tale of Macy Stoddard. Her adventures while working on Hallstead Island, as a Rehab nurse to Alexandria Hallstead, she is trying to come to terms with the death of her parents. What she discovers is so much more than secrets and nursing. Written in first person. She encounters is threats, hostility, and more than secrets. This is not a fast paced story, but is well written with many facets to the characters and the story. Good reading for a lazy afternoon. Received for an honest review.